Because everyone deserves the benefits of the best digital technology to help them grow their business, but not everyone has the skills they need, Google launched an ambitious training program across Europe. We've now reached more than 3 million Europeans, the EU recognized our contribution with the EU Digital Skills Award, and many of those who spent time on the training are seeing real impact. Giuseppe Di Pasquale’s is the owner of Le Zagare di Vendicari, an agriturismo business in Sicily. Giuseppe wanted to grow his business online but lacked the skills to make that happen. 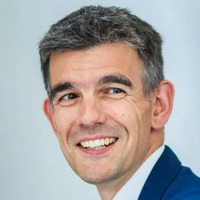 He took up training through Eccellenze in Digitale, our Italian digital skills platform, and has now applied what he learned to his business. He’s seen visits to his site increase by 40 percent and doubled his bookings. Giuseppe’s story is just one of more than 3 million European graduates of our program. Our training aimed to help those who could put it to work immediately to make a difference—students, small business owners, people who were not in education, employment or other training—because we know that businesses with the right digital skills are growing faster, creating more jobs and exports and making an important contribution to their countries. 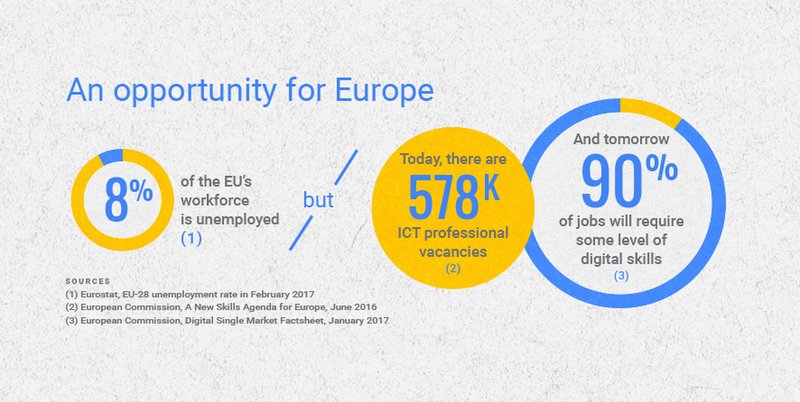 The EU identified a digital skills gap—500,000 jobs needing skills that people don’t have. That’s why we launched the Digital Workshop program. Over the last 2.5 years, we have worked with partners across Europe to achieve scale and impact, from the Ministry of Labour and other partners to train young unemployed people through Crescere in Digitale in Italy, partnering with Bertelsmann and Udacity to deliver 13,000 Android nanodegree scholarships, to developing new curriculum with The Good Things Foundation in the U.K., and many dedicated Training partners who deliver the course content week after week. Training ran online and in hundreds of in-person sessions, and was tailored to the most pressing needs in each country, youth unemployment in Spain, digital exports in Germany, small businesses and youth in Italy. We commissioned Ipsos to survey our training alumni to see how the training has helped them to grow their careers and businesses and found fantastic results. Ipsos found that 79 percent of SMBs trained were more confident using digital tools to run their business. And half the students trained feel more confident in their professional future. Sixty-nine percent of small businesses trained changed at least one aspect of how they run their business online. The top five included optimizing websites for mobile, for search and for social media, as well as using website analytics and developing better site content. In fact, 49 percent of SMEs felt the training helped them get ahead of the competition. So people and businesses are improving their confidence, boosting their skills and making changes that grow careers and businesses faster and create new jobs. Over a half of SMEs noticed a positive change in business results within 14 weeks after the training. They’re winning new customers, increasing sales and profits. And vitally, particularly in countries where youth unemployment is a big issue, 18 percent of students trained found a job, started their own business or started to work freelance. You can read more stories of European graduates of our training programs and how they are applying the skills they acquired to their careers. And if you want to raise your own skills, it’s not too late to get started—visit our Growth Engine for Digital Skills site today!